I don't know any more than the information below, but I do know that the word "Holographic" in the description is all I need to know! My guess is that the China Glaze Tronica Specialty Collection should be available within the next month or two, because I saw this ad in the January issue of NailPro Magazine. Once again, thank you China Glaze for listening to your customers and making our nail polish wishes come true! "Futuristic and edgy, the China Glaze Tronica Specialty Collection is a holographic 3D selection of evolutionary and fun nail colors. These 12 colors are fashion forward, high-tech, bold, sleek and sure to change the face of the nail world! With names such as "Hyper Haute" and "Gamer Glam", China Glaze combines the two worlds of innovative technology and high fashion color to create a collection that is sure to stimulate all the senses." Looking forward to swatches of these. Awesome. Thanks for sharing, Mary. Now this is something I'm going to have a hard time waiting for! Okay, so they're tying into the release of Tron Legacy (which I think is going to go over about as well as The Phantom Menace did...but for the sake of the diehard fans I hope I'm kind of wrong.) Smart business practice - and either metallics, duochromes, holographics, or (be still my heart) metallic duochromes would go well with this particular theme. And if there is such a thing as a metallic holographic, I think I will actually squee out loud. And I'm strictly an inner-voice squee-er. Oh my LORD, I can't wait for this collection! I am sooooooo excited about Tronica! I'm starting saving money... too many collections are coming soon! Ooh thank you for the info! I'd better save any money I get from Christmas! THIS is the collection that will end my no-buy! Thanks for sharing, Mary! You had me at holographic. I love holos! You're making me want to subscribe to NailPro Magazine. Hmm, I'll need to look into if I can actually subscribe. Wow, this is so exciting, thanks for the heads up!! This is gonna make me broke!!! They all look amazing! I didn't know about this! oh my lord! i am pumped about this thankgod you shared this with us! And THIS is why China Glaze is my favorite brand, they really listen to their fans! Thanks OPI for making such a boring Texas collection because all my money will be going to China Glaze. These look like they have some potential! Fantastic news for my Friday night! I can see these holos in combination with the crackle polishes. Oh my! MORE EXCITEMENT...and it's about time! YAY! 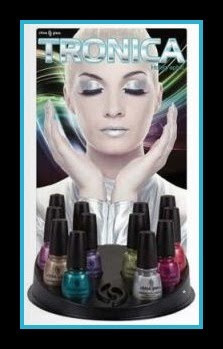 Wow, this is going to be an amazing introduction to 2011 for China Glaze, three awesome collections coming out within the next couple of months! SUPER excited for more details of this!! Great news! Can't wait to see some swatches or bottle pics :) Let the holo madness begin! Super news from China Glaze. I posted this on my Blog and linked to yours. Hope it's ok by you. I'm really excited about this one, so pretty! Ahhhh. Oh my gooooosh! I'm so excited!! The two types of releases I get most excited for- nail polish and video games! And this combines both! Plus they're HOLOGRAPHIC polishes?! I can't wait! I hope this is just as holo as their previous collections! I love Silver holos..I will buy one of all of the rest of the colours but I am getting six of the silver, lol.. I was late to the OMG party and so have had to pay top dollar for the collection. I won't miss this one!!! Also, please be careful as people are buying this new collection and trying to pass them off on Ebay as the much better OMG and KS (at very high prices of course). Come on CG, give us something truly new. New colors not the same old stuff that is not even as good as your previous.